I’m still in China, as part of a week-long teaching assignment about markets, entrepreneurship, economics, and fiscal policy at Northeastern University in Shenyang. One point that I’ve tried to get across to the students is that China should not copy the United States. Or France, Japan, or Sweden. To be more specific, I warn them that China won’t become rich if it copies the economic policies that those nations have today. Instead, I tell them that China should copy the economic policies – very small government, trivial or nonexistent income taxes, very modest regulation – that existed in those nations back in the 1800s and early 1900s. That’s when America and other western countries made the transition from agricultural poverty to industrial prosperity. In other words, pay attention to the polices that actually produced prosperity, not the policies that happen to be in place in 2016. With this in mind, I’m delighted to share a new National Review column about the ostensibly wonderful Nordic Model from Nima Sanandaji. He starts by noting that statists are big fans of nations such as Sweden and Denmark. Sounds nice, but there’s one itsy-bitsy problem with the left’s hypothesis. Simply stated, everything good about Nordic nations was already in place before the era of big government. …the social success of Nordic countries pre-dates progressive welfare-state policies. …their economic and social success had already materialized during a period when these countries combined a small public sector with free-market policies. The welfare state was introduced afterward. Here are some of the key factoids about fiscal policy. …in 1960, the tax rate in [Denmark] was merely 25 percent of GDP, lower than the 27 percent rate in the U.S. at the time. In Sweden, the rate was 29 percent, only slightly higher than in the U.S. In fact, much of Nordic prosperity evolved between the time that a capitalist model was introduced in this part of the world during the late 19th century and the mid 20th century – during the free-market era. And here’s the data about equality (though I think it’s far more important to worry about the degree of upward mobility rather than whether everyone has a similar amount of income). …high levels of income equality evolved during the same period. Swedish economists Jesper Roine and Daniel Waldenström, for example, explain that “most of the decrease [in income inequality in Sweden] takes place before the expansion of the welfare state and by 1950 Swedish top income shares were already lower than in other countries.” A recent paper by economists Anthony Barnes Atkinson and Jakob Egholt Søgaard reaches a similar conclusion for Denmark and Norway. Our friends on the left think that government-run healthcare deserves the credit for longer lifespans in the Nordic world. Nima explains that the evidence points in the other direction. In 1960, well before large welfare states had been created in Nordic countries, Swedes lived 3.2 years longer than Americans, while Norwegians lived 3.8 years longer and Danes 2.4 years longer. Today, after the Nordic countries have introduced universal health care, the difference has shrunk to 2.9 years in Sweden, 2.6 years in Norway, and 1.5 years in Denmark. The differences in life span have actually shrunk as Nordic countries moved from a small public sector to a democratic-socialist model with universal health coverage. Not to mention that there are some surreal horror stories in those nations about the consequences of putting government in charge of health care. Here’s the evidence that I find most persuasive (some of which I already shared because of an excellent article Nima wrote for Cayman Financial Review). Danish Americans today have fully 55 percent higher living standard than Danes. Similarly, Swedish Americans have a 53 percent higher living standard than Swedes. The gap is even greater, 59 percent, between Finnish Americans and Finns. Even though Norwegian Americans lack the oil wealth of Norway, they have a 3 percent higher living standard than their cousins overseas. 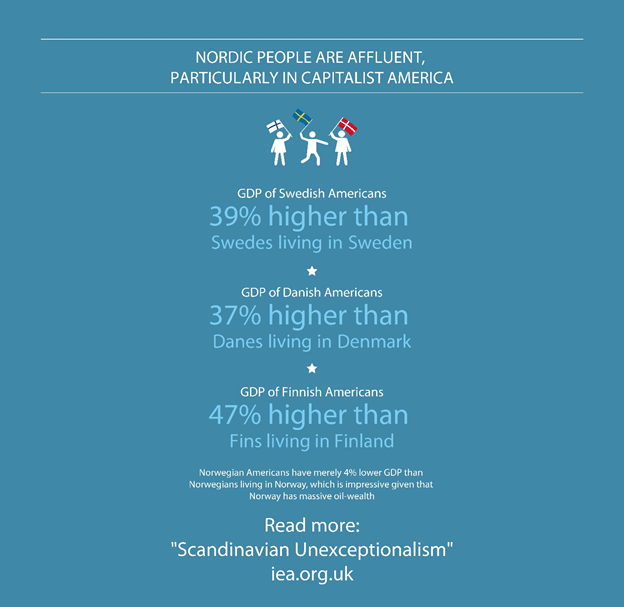 …Nordic Americans are more socially successful than their cousins in Scandinavia. They have much lower high-school-dropout rates, much lower unemployment rates, and even slightly lower poverty rates. 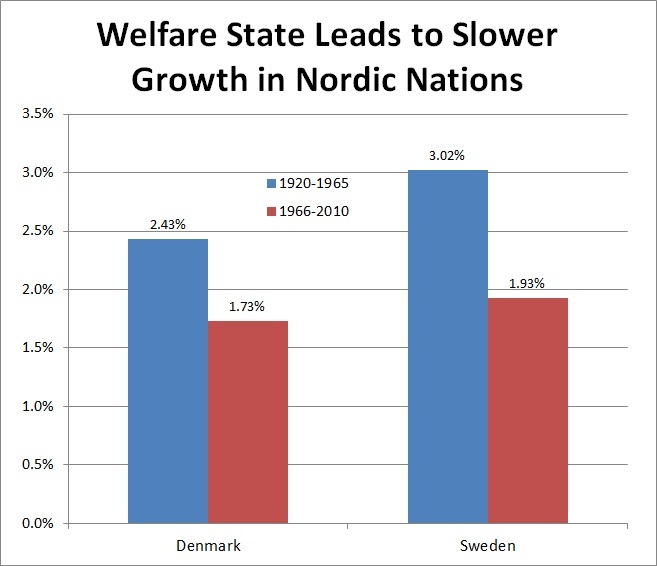 Nima concludes his article by noting the great irony of Nordic nations trying to reduce their welfare states at the same time American leftists are trying to move in the other direction. Nordic-style democratic socialism is all the rage among Democrat activists as well as with liberal intellectuals and journalists. But in the Nordic countries themselves, this ideal has gradually lost its appeal. …During the past few decades, the Nordic countries have gradually been reforming their social systems. Taxes have been cut to stimulate work, public benefits have been limited in order to reduce welfare dependency, pension savings have been partially privatized, for-profit forces have been allowed in the welfare sector, and state monopolies have been opened up to the market. In short, the universal-welfare-state model is being liberalized. Even the social-democratic parties themselves realize the need for change. The net result of these reforms is that the Nordic nations are a strange combination of many policies that are very good (very little regulation, very strong property rights, very open trade, and stable money) and a couple of policies that are very bad (an onerous tax burden and a bloated welfare state). I’ve previously shared (many times) observations about the good features of the Nordic nations, so let’s take a closer look at the bad fiscal policies. Sven Larson authored a study about the Swedish tax system for the Center for Freedom and Prosperity. The study is about 10 years old, but it remains the best explanation I’ve seen if you want to understand the ins and outs of taxation in Sweden. Here’s some of what he wrote, starting with the observation that the fiscal burden used to be considerably smaller than it is in America today. Sweden was not always a high-tax nation. …the aggregate tax burden after World War II was modest. But then things began to deteriorate. …over the next four decades, there was a relentless increase in taxation. The tax burden first reached 50 percent of economic output in 1986 and has generally stayed above that level for the past 20 years. Though Sven points out that Swedish politicians, if nothing else, at least figured out that it’s not a good idea to be on the wrong side of the Laffer Curve (i.e., they figured out the government was getting less revenue because tax rates were confiscatory). A major tax reform in 1991 significantly lowered the top marginal tax rate to encourage growth. The top rate had peaked at 87 percent in 1979 and then gradually dropped to 65 percent in 1990 before being cut to 51 percent in 1991. Subsequent tax increases have since pushed the rate to about 57 percent. In the interest of fairness, let’s acknowledge that there are a few decent features of the Swedish tax system, including the absence of a death tax or wealth tax, along with a modest tax burden on corporations. But the bottom line is that Sweden’s overall tax system (and the same can be said of Denmark and other Nordic nations) is oppressive. And the system is oppressive because governments spend too much. Indeed, the welfare state in Sweden and Denmark is as large as the infamous French public sector. To be sure, the Swedes and Danes partially offset the damage of their big welfare states by having hyper-free market policies in other areas. 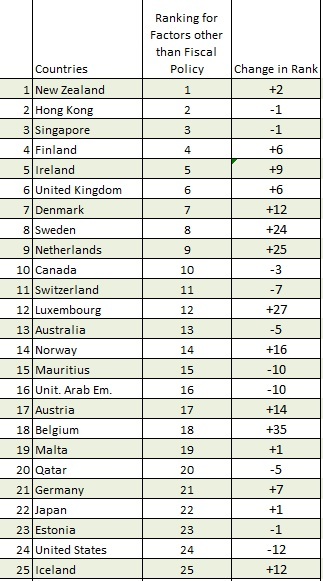 That’s why they rank much higher than France in Economic Freedom of the World even though all three nations get horrible scores for fiscal policy. Let’s close by circling back to the main premise of this column. Nima explained that good things happened in the Nordic nations before the welfare state exploded in size. So I decided to see if we could ratify his hypothesis by checking the growth numbers from the impressive Angus Maddison database. Here’s a chart showing the average growth of per-capita GDP in Denmark and Sweden in the 45 years before 1965 (the year used as an unofficial date for when the welfare state began to metastasize) compared to the average growth of per-capita GDP during the 45 years since 1965. Unsurprisingly, we find that the economy grew faster and generated more prosperity when government was smaller. Gee, it’s almost as if there’s a negative relationship between the size of government and the health of the economy? What a novel concept! P.S. All of which means that there’s still no acceptable response for my two-question challenge to the left. P.P.S. Both Sweden and Denmark have been good examples for my Golden Rule, albeit only for limited periods. an economically freer Nordic area of times past achieved higher growth in a pre-information age slower growth world; compared to the later welfare Nordic area which is unable to create even average growth in the midst of our technological age. Propelled to the top on the worldwide prosperity rankings when they achieved growth above the world average for a protracted period of time; while now in a fast decline as their demotivating welfare states prevent them from utilizing the high growth potential of our technological age. Result: economic growth less than half the world average = swift decline and prosperity parity with middle-income countries by the latter part of this century. World growth trendline = 4% >> Nordic growth trendline = 1.5% = DECLINE. There’s one especially great graph of their Greek predictions vs reality. Thanks for your blog by the way! Gosh, Dan, using your trip to make very good points about the Nordic countries is great. However, I would have thought you would just play Stossel’s “Is America #1” for the students and tell them to do the same on the mainland that Hong Kong has been doing since the 50s.